I hope we’re all ready for Saturday because Kentucky vs. Wisconsin and Duke vs. Michigan State might be one of the best Final Four slates the college game has ever seen. Generally, a statement like that would just be hyperbole but that last sentence might be 100% true, so with that being said, here are a few quick Final Four thoughts in advance of this weekend’s games. I say this on a number of levels. First off, strictly from a basketball standpoint, having two of college basketball’s most dominant post players going head-to-head for 40 minutes would be amazing. But from an NBA Draft perspective, this match-up would have Chad Ford foaming at the mouth and reduce him to sending out tweets where he just mashes the keys on his Blackberry (Chad Ford definitely still uses a Blackberry, right?). For those of us who pretend to be NBA scouts on Twitter using slightly more up to date technology, debates about the Towns/Okafor number one pick have started heating up in the past few weeks, and this match-up would only fuel the fire. Friendships may be lost, franchises hang in the balance, NBA scouts all over the country are running around with lampshades on their heads trying to figure out the Towns vs. Okafor question. The great thing is, both guys look like amazing prospects. I know it seems impossible that both sides of this debate might be right, but the possibility exists that both players won’t miss at the NBA level and can both be a major piece on a team that wins an NBA title. At this point, even if Kentucky or Duke lose, can we somehow schedule a Towns vs. Okafor 1 v 1 match-up for Monday afternoon? I’m guessing that won’t happen, but the prospects of an Okafor vs. Towns meeting is enough for me to root for the Duke and Kentucky Death Stars in the Final Four just to see the likely No.1 and No. 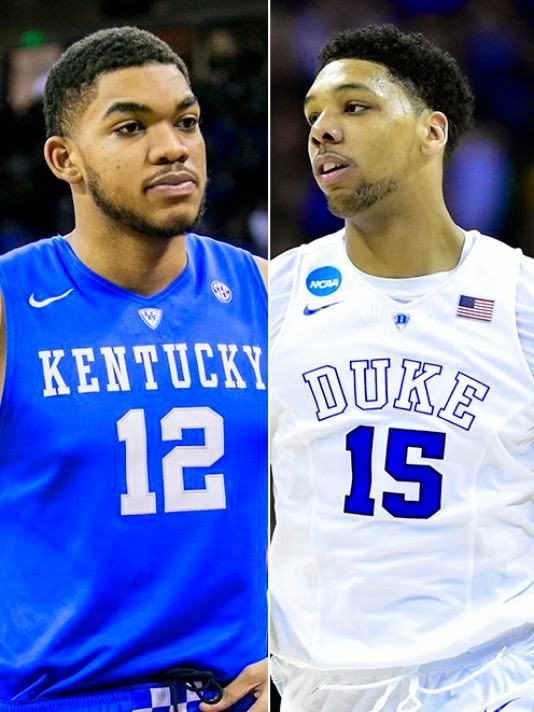 2 picks in the 2015 NBA Draft square off against each other with a championship on the line. 19:47- Frank Kaminsky made Three Point Jumper. Assisted by Josh Gasser. 19:17- Sam Dekker made Three Point Jumper. Assisted by Frank Kaminsky. 18:36- Frank Kaminsky missed Three Point Jumper. 16:38- Duje Dukan made Three Point Jumper. Assisted by Bronson Koenig. 14:42- Sam Dekker made Three Point Jumper. Assisted by Bronson Koenig. 13:32- Sam Dekker made Three Point Jumper. 11:42- Nigel Hayes made Three Point Jumper. Assisted by Bronson Koenig. 9:56- Nigel Hayes made Three Point Jumper. Assisted by Sam Dekker. 5:18- Josh Gasser made Three Point Jumper. 4:37- Josh Gasser missed Three Point Jumper. 1:52- Sam Dekker made Three Point Jumper. 0:20- Sam Dekker made Three Point Jumper. And somehow, Arizona still hung around. I don’t know what’s crazier, the fact that Wisconsin couldn’t miss a shot in the second half or that Arizona was able to weather that storm and keep things tight. After going 8–10 from three in the first 18 minutes of the 2nd half, the Badgers still needed two more Sam Dekker 3’s t0 bury the Wildcats for good. Absolutely insane. The rational part of me thinks there’s no way Wisconsin can replicate this against Kentucky, but let’s remember that Arizona is a pretty damn good defensive team in their own right boasting NBA caliber talent and a number of very strong defenders. 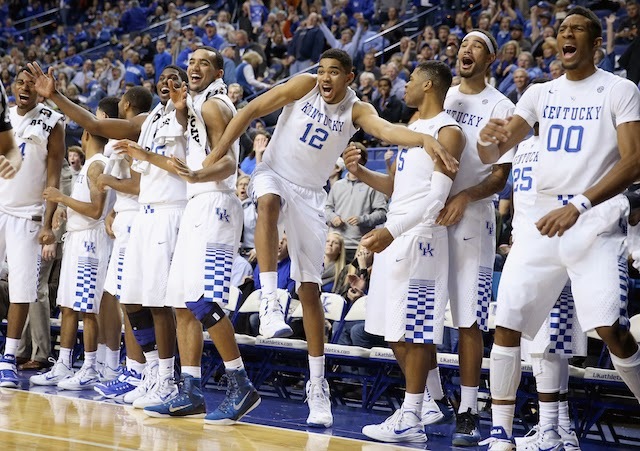 3.Can we table the “Kentucky’s the best team ever” conversation until these last two games are played? I know it’s probably getting more clicks and page views than any of the other storylines from the Final Four combined, but I’d like to bask in the glow of these final 3 games before we get overloaded with trying to figure out where this Kentucky team ranks in the history of college basketball. To be clear, I don’t disagree that they’re up there or even that they’re the best should they complete an undefeated season. But if they lose to either Wisconsin or Duke/Michigan St. no one is making a case for them being the best team ever, right? Skip Bayless spontaneously combusting into diarrhea aside, let’s just enjoy these last few games of what has been an amazing season before we start arguing about where this team ranks amongst the all-time greats. 4.We’ve seen offense vs. defense before in various sports, how does that usually work out? With all due respect to Duke-Michigan State, the Wisconsin-Kentucky rematch of last year’s Final Four is the game everyone around the country is salivating about. Though Kentucky is a five point favorite right now and looks to have the advantage over the Badgers heading into this game, counting out the Badgers after all we’ve seen from them would be ludicrous. Though there’s more to this game than just Wisconsin’s extremely efficient offense vs. Kentucky’s all-time great defense, that’s basically what this game boils down to. Which leads me to the above point; we’ve seen historically good offenses go up against historically good defenses and it usually goes the same way every time. Whether we’re talking about good pitching dominating good hitting in the MLB playoffs or the Seahawks embarrassing the Broncos in the Super Bowl 14 months ago, things usually don’t go too well for the offense in the above scenario. So what does this mean? Well, not all that much I suppose. Ultimately, the winner of Kentucky-Wisconsin will be decided on the court and doesn’t have anything to do with what’s happened in the past (I promise that’s the only painfully obvious “analysis” in this post), BUT the more I keep thinking about this match-up, the more I keep coming back to the fact that we’ve seen defense triumph over offense too many times to casually brush that away in this case. Then again, if the Badgers are hitting 66% of their three pointers the way they did against Arizona, history won’t mean anything. It’s not on the same level as Okafor vs. Towns, but in the event that Wisconsin is able to take down Kentucky, Dekker vs. Winslow and Kaminsky vs. Okafor wouldn’t be too shabby either. Okafor and Kaminsky have dominated headlines all season, but in the past few weeks it’s been Dekker and Winslow who have played huge roles in powering their respective teams to the Final Four. Dekker was nearly unstoppable against UNC in the Sweet 16 tallying 23 points and 10 rebounds on 10–15 shooting, and he followed that up by going supernova against Arizona to the tune of 29 points, including hitting 5 of 6 from behind the arc. All Winslow’s done in four tournament games thus far is average 14 ppg, 9.5 rpg, 3.2 apg, and he’s also recorded a combined 15 blocks and steals terrorizing opponents on defense. Both guys have great athleticism, are peaking at the right time, and have legit NBA aspirations. And as for Okafor vs. Kaminsky, it will be extremely interesting to see how Okafor handles a big who can operate on the perimeter with a high degree of skill. Guarding a player like Kaminsky will be a great test for Okafor as he will face players with similar skillsets once he gets to the NBA. You have the villain in Kentucky that’s looking to make history. The 1a villain in Duke, because, you know, they’re Duke and Coach K’s hair has looked the same since 1965. You have the feel-good story in Wisconsin led by Frank Kaminsky who played *gasp* all four years of college. And rounding things out, you have the ‘underdog’ (in seeding only) in Michigan State to keep everyone on their toes. There’s a ton of great players with NBA prospects and four Hall of Fame coaches squaring off, so there’s no shortage of storylines to keep everyone entertained regardless of how Saturday’s games shake out and which two teams we end up watching on Monday night.